Inspiration: As a child, I would roll pennies with my dad. I would save my coins and at the end of every year on Mother’s Day, I would count them and wrap them with my dad to buy my mother her gift. I always loved the shiny pennies and would save them instead of spending them. Even as an adult, I always save my pennies. I love the copper color and how they tarnish over time. About the Art: I find the number 14 to be a balanced number. Because it is angular, it always seems to be in balance to me. The one is completely horizontal as is the one edge of the 4 – then just a triangle piece that attaches itself to create a 4. It is neat, compact and balanced. Materials: I work in encaustic wax and oil paint. I made the wax have texture, just like the penny has smoothness and raised parts. When you rub a penny with your fingers, you can feel the bumps just like the wax. 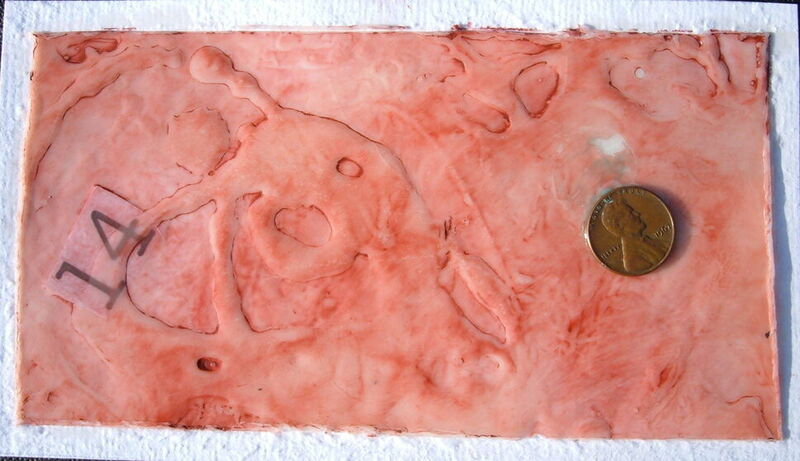 To make a penny, they create a wax mold and then they make a casting of it. So it was natural for me to use wax for this. If you look closely, there is a slight impression of the penny in the wax. About the Artist: AJ Grossman finds that paintings are a constant exploration of herself. She started her career as a fashion illustrator, a profession that has been replaced by photography. Fashion illustrators are trained to focus on line and gesture to give the viewer an illusion. As AJ grew in her career and the digital age expanded into the fashion world, she climbed the corporate ladder to art/fashion director for major fashion companies. After 20 years of producing art for the masses in fashion and advertising, AJ decided it was time to make art that expresses who she is. 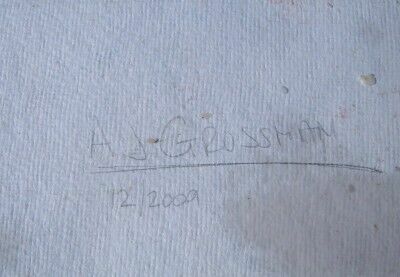 AJ had found that finding her voice as an artist has been a journey. She has been experimenting with different media to discover that voice the last few years. Always working in the abstract, she discovered the ancient method of encaustic painting and it is her exclusive medium of choice. The melting of the bee wax, the adding of pigment, the aroma that scents the studio when working, the heating, the re-heating of the media, the capacity to etch, scrape, collage and build up layers are only part of the appeal of this media for her. While encaustic media has a basic set of rules, it is during the painting process that AJ finds herself breaking the rules and creating a piece that may not be able to be reproduced. Much of AJ’s work has a similar pattern and rhythm to it, and then one piece will break away from that — similar to the way that life has unfolded. It’s an opportunity that leads her down a different path. AJ sees change as an opportunity and an exploration of growth, this media that can change instantly allows her to explore a new vision in her art. Price: This piece is not currently for sale: There are great reasons to purchase Penny Experiment art. If you would like to purchase Coppertone #14 or other artwork from this 100 Penny Postcard Art series, please email me and I will put you on my list to inform when this series is for sale. 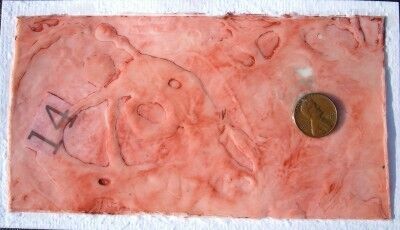 This entry was posted in Penny Art, Penny Experiment and tagged #14, AJ Grossman, coppertone, encaustic wax, Penny Art, Penny Experiment, penny postcard, wax art. Bookmark the permalink.